On July 6th, the Patio Garden restaurant at Weirs Beach will kick off the sixth season of summer jazz concerts in Weirs Beach. The Weirs Jazz series was recognized as the “Best of NH” during its inaugural season in 2013, and has grown to feature jazz acts from Boston, NYC, and other jazz hotspots. The Patio Garden will present three jazz shows every weekend through August 19, weather permitting. The casual, outdoor Patio Garden restaurant is located at the end of the Weirs Beach boardwalk, across the footbridge from Lakeside Avenue. The concerts at the Patio Garden are free and open to all ages. Full bar and menu are available. For more info, visit facebook.com/weirsjazz. The Bradley Jazz Collective is a highly creative ensemble that plays a mix of original music and interesting arrangements of eclectic tunes. It consists of saxophonist Mike Sakash, bassist Al Hospers, and drummer Craig Bryan. Sakash is a sax player, writer and arranger for the Portland Jazz Orchestra, and the director of the music department at Fryeburg Academy. His 2018 album, “Wood Dance”, includes legendary bebop alto saxophonist Richie Cole, and Maynard Ferguson’s long-time trombonist Reggie Watkins. Hospers, a professional bass player for 53 years, toured with the Buddy Rich band and Blood Sweat & Tears in the 1980’s. He has been a programmer of music software at companies including Dr. T’s and Harmonix, the developers of Guitar Hero. Hospers plays and performs with a wide variety of bands in the Mount Washington Valley, and owns the Clever Sounds recording studio. Bryan is the drummer for Bruce Marshall and the Nor’ Easters, Jonathan Sarty, Sounds Clever & the Valley Horns, and the Smoke House Boys. He can be heard on singer-songwriter Heather Pierson’s latest album, “Motherless Child”. He is a middle school music teacher in Fryeburg, ME. Donahue has played on 11 albums, and has performed with Maceo Parker, The Headhunters, Corey Glover, The Rebirth Brass Band, The Radiators, SemiSonic, Chris Duarte, Tim Reynolds, Johnny Winter and members of The Commodores. He currently performs with many groups including Elsa Cross, the Amorphous Band, FunkyTown, Todd Royce, Joe Gattuso, and Steve Carter. Appearing with Donahue is Eric Chase on saxophone and Scott Kiefner on bass. The house band for the Weirs Jazz series, the Boardwalk Jazz Quartet has been playing in Weirs Beach on Sunday nights in July and August for over 20 years. The group plays jazz standards from the 1930’s through the 1970’s, as well as arrangements of contemporary tunes and originals. The bandleader is Rob Ames, whose 2016 record album of all originals, “Songs from the Boardwalk”, featuring his soprano saxophone playing, is available on iTunes, Amazon, Spotify, and elsewhere. The band features Steve Warnick on keyboards, Al Hospers on bass, and Dave Ellis on drums. The quartet combines the musical efforts of leader Emanuel with Chris Salemme on drums, Chazz Rogers on bass, and Keith Perry on guitar to create an exciting environment for the enjoyment of jazz. The group is based out of the University of New Hampshire, and plays all over the Granite State. The house band for the Weirs Jazz series, the Boardwalk Jazz Quartet has been playing in Weirs Beach on Sunday nights in July and August for over 20 years. The group plays jazz standards from the 1930’s through the 1970’s, as well as arrangements of contemporary tunes and originals. The bandleader is Rob Ames, whose 2016 record album of all originals, “Songs from the Boardwalk”, featuring his soprano saxophone playing, is available on iTunes, Amazon, Spotify, and elsewhere. The band features Steve Warnick on keyboards, Al Hospers on bass, and Jared Steer on drums. Trumpeter Ryan has performed with Greg Hopkins, Jeff Stout, Bill Pierce and Tiger Okoshi. He’s a soloist with the Big and Phat Jazz Orchestra and the Ryles Jazz Orchestra, plays in the Adagio Big Band, and is a member of the River City Band and the B Street Bombers. Appearing with Ryan is Jason Emmonds on bass and Jeff Samataro on drums. A special performance of the Boardwalk Jazz Quartet, with a guest appearance by smooth jazz recording artist Mike Levineon keyboards. Levine, of Miami, Florida, where he is a mainstay of the jazz and Latin scenes, has recorded several original CDs, including his latest, 2017’s “Star Gazing”, featuring Ed Calle, Will Lee, and other renowned South Florida musicians. As an accompanist, Levine has played with jazz instrumentalists Tom Scott, Michael Brecker, Toots Thielmans, Stanley Turrentine, Nat Adderley, Randy Brecker and Ira Sullivan; and jazz vocalists Michael Bolton and Mel Torme. Levine will appear with Rob Ames on saxophone, Al Hospers on bass, and Jared Steer on drums. http://www.mikelevinemusic.com. Walsh is a NH-seacoast based full-time drum instructor and performer. He teaches at the Portsmouth Music and Arts Center, and is the drummer for several seacoast bands, including Mother Superior and The Sliding Royales, Equal Time, Fiveighthirteen, and Weird Turn Pro. Walsh has been a student of drumming for over 30 years, and has studied with Bob Gullotti, Les Harris Jr., Nancy Smith, Dave Dicenso, Steve Michaud, Dan Weiss, and Peter Moutis. Appearing with Walsh is Tom Robinson on piano and Nate Therrien on bass. Chase has been performing throughout New England for the last 38 years. He was the sax player for a band that went through three name changes over 30 years (Straight No Chaser, Raccoon Beach, and The Attractions) but kept the same core of musicians. Chase played with this group at the Blue Note in New York City, the Newport Jazz Festival at Saratoga Springs, and as the opener for Joe Lovano at the Portsmouth Music Hall. Chase has also played with the Seacoast Big Band, the Players, Tongue in Groove, and the Joe DeRose big band. Appearing with Chase is Scott Kiefner on bass and Tim Gilmore on drums. Hailing from Plymouth NH, the Sam Summer Band is a collective of young musicians who create a light-hearted atmosphere to provide a unique twist on traditional jazz. The band features Samantha Liardo on clarinet and voice, Emily Lombardo on sax and flute, Chris Heffernan on trombone, and Owen Walker on bass. 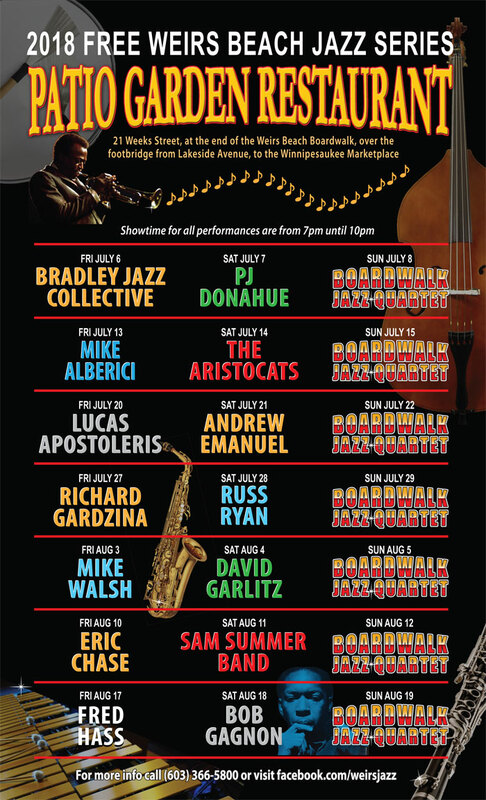 Sunday, Aug 19, 7pm-10pm: Boardwalk Jazz Quartet featuring Rob Ames.